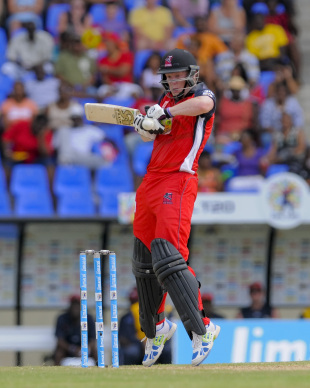 Kevin O'Brien believes his performances in the CPL are proof of how far Ireland have come in the T20 format. Speaking after a man-of-the-match performance that led to Red Steel handing the defending champions, Tallawahs, their first loss in the tournament, O'Brien said this competition helped him become 'more assertive' as a player. "Playing in leagues around the world and just by playing more and more cricket with Ireland, my game's developed. But in the CPL, I really enjoy showing what I can do. Today was one of those days where everything clicked," he said. "I'm enjoying the tournament once again and really love playing for Red Steel. I think it's helped me develop and I do believe that more Irishmen can be playing in these and other worldwide tournaments. We've improved as a lot. The CPL suits me." O'Brien said Ireland's recent World T20 display as well as a formidable showing in the West Indies, where they won one of the three T20s, were evidence of the team's growth, with their players getting to play in different conditions and improve. He said that, in addition to being more aggressive with the bat, he was happy with the faith the Red Steel captain Dwayne Bravo has shown in his bowling. He said he was glad to see his form with the ball paying dividends as he has been working very diligently at it - seen in his four wickets today. "I've been practicing and honing my bowling skill a lot," he said. "I'm an all-rounder and while I've been getting off with the bat, I'm relieved that Bravo will chuck it to me when he needs a wicket or two and further relieved when I can repay his faith. In the CPL, I get more chances to bowl and I've been doing this of late with Ireland so the more I bowl, the better for me."